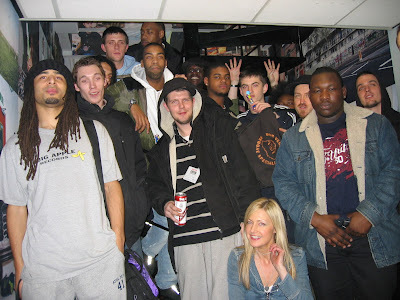 "Landmark Show for Dubstep hosted by Mary Ann Hobbs. Sounds of the future feat. Distance, Mala of Digital Mystikz, Skream, Kode 9 & Space Ape, Vex’d, Loefah, and Hatcha. This show is an essential for anyone who hasn't heard it!" "Esse especial, que foi ao ar na madrugada do dia 09/01/06 na BBC Radio 1, reuniu os principais expoentes do gênero. Comandado por Mary Anne Hobbs, o programa trouxe sons de Burial, Skream, Benga, Kode 9, Digital Mystikz, entre outros." Yeah, it was what it was, it is what it is, that nite was a special nite for the DUBSTEP scene ! and sincerely, I was entirely shocked after listening the 2-hours set !.. The INTRO is amazing, from UK, US, Brazil and Canada, dubstep warriors broadcasting dubstep to the masses ! -- "They're getting the virus, they're being attached to something new and in '06 .."
-- "it's a hard job being a soldier, breaking dubstep to the masses..."
-- "This is the breezeblock dubstep warz special. Tonight you're gonna feel the energy of the most exciting underground scene in the UK. Emerging out the south of London and now... every corner of the planet, from Brighton to Baltimore, from Bristol to Brazil... From 7 of the scene's most gifted players... We've the god fathers ... Hatcha, and Kode9... And we have next generation producers that you'll see blazing on the underground this year, we've got Skream on the place, we've got Loefah, Distance is here...It's January of 2006 and if you're looking for music that's gonna change your life, it's here, it's live, on the Breezeblock tonite..."
-- "his name is Mala... u ready to do this Mala?.." "the sound has space in it... It's not the same frequency as like house music, it's not the same freq as in DnB.. It's its own frequency"
-- "With more of the sonic fire-storms we love so much... this is Vex'd ..."
If you really enjoy dubstep music, it's a MUST ! (Personally I liked >80% of the tracks). If you're looking for *NOISY* dubstep, this is not the right place dudeee ;-).